Novel from an intercontinental flight, you’re traveling wearily from side to side in Umbria when Orvieto materializes soaring on top of its Tufa boulder rise right on time for a wholesome, re-invigorating eating. A real haven. I regularly send guests to Trattoria dell’Orso situated at 18 Via della Misericordia in Orvieto. Here the owners have been welcoming visitors kindly for every one of the 12 years I’ve been working in Italy. Be forewarned: they habitually close up during the entire month of July. For fidgety children, I recommend the Orvieto Underground tour. The ticketing booth is on the other side of the Duomo door and is a bit vague, but trust me: the visit is crammed with a wealth of sets of steps, some very high, narrow spaces and low clearances. If you are a person, you like gelato. And if you like gelato, you ought to journey to the far corner of the Duomo square for dessert at Piazza del Duomo, 14. 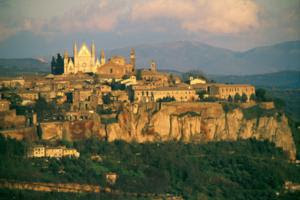 Hang about in Orvieto until 4pm and join in the "passegiata" promenading with the local natives whilst eating gelato. For those younger and à la mode – if you are above 21 and can stay up after 10 – the place to be in Orvieto is in Piazza Marconi 2 at Velia’s Champagneria immediately out the Piazza of the Duomo. Very comfortable and appealing, this hip kitchen and bar pours with an enviable cascade of delicious food and sparkling sweetness.